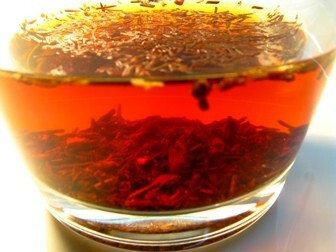 Rooibos tea, often called red tea or red bush tea. It is also one of the best well known herbal teas and possibly the best alternative to regular black or green tea. Healthy and sweet, this is the tea for you! Rich in antioxidants, vitamins and minerals, this is a wonderfully beneficial tea suitable both for adults and children. Do you have to cut down on caffeine? Do you find that green or black teas have a flavor that is too bitter for your taste buds? Come and find out why this herbal red tea may just be the solution you have been waiting for. and enjoy a cup of red bush tea together! 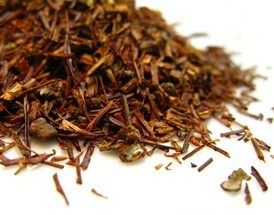 Rooibos is an herbal tea, though you will find it often next to green or black teas. The former comes from the plant aspalathus linearis while the latter come from the tea bush camellia sinensis. The rooibos plant is a legume native to South Africa in the region of Cederberg where it benefits from the high temperatures with little rainfall. It has long red stems with dark green needle-shaped leaves, yellow flowers that bloom in early autumn and long roots that reach deep down to find water in the dry regions of South Africa. Harvested in the summer (January to March), rooibos is handpicked and then it is either left unfermented or goes through an oxidization process that leads to different varieties of rooibos herbal tea. Leaves turn from green to red with oxidization. Is Red tea and Rooibos tea the same? Rooibos herbal tea is often called red tea or red bush tea for two main reasons: the oxidized leaves are bright red and a cup of this tea has a red color. Rooibos actually means “red bush” in Afrikaans and it was a name given by the Dutch Afrikaners. Are there other “red teas”? Yes, in the Chinese grading system, what Westerners refer to as black tea due to the color of the leaves, is considered by the Chinese as red tea due to the color of the brew. At the same time, Pu Erh, the post-fermented tea, is referred by the Chinese as black or dark tea and by Westerners either as dark tea or red tea by default. There is also another herbal tea referred to as red tea, hibiscus tea has a vibrant red color once brewed, so some people call it red tea, too. This tea may be left as it is picked or oxidized (not fermented) and this results in 2 of the main varieties of rooibos tea: Green Rooibos (not oxidized) and Red Rooibos (Oxidized). 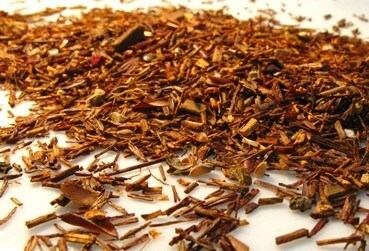 Additionally, some tea companies will add flavors and create a third variety of rooibos: the flavored rooibos tea. Unfermented or unoxidized rooibos is often referred to as green rooibos, because the leaves retain their green color. As oxidization tends to naturally occur, the process of preventing it tends to be expensive as leaves have to be dried right after picking. It has a malty and somewhat grassy flavor and rather than being red when brewed, green rooibos makes a yellow-colored tea. In terms of benefits, green rooibos is better for your health than red rooibos. Both are great for your, but the level of antioxidants is higher in the unoxidized form. The oxidization process turns the green rooibos leaves red, a nice orange-red color. Once harvested the leaves are cut finely, crushed to bruise the leaves and then left to oxidize by drying under the African sun. The fermentation process reduces the amount of antioxidants in the tea, and it is this that contributes to the changing color in rooibos. The brewed tea is red in color and is much sweeter and stronger in flavor than the green variety. With the growing popularity of rooibos herbal tea, more and more companies are offering this tea in their tea selection often blended with flavors, fruits and other herbs to enhance further the flavor of the tea. Today you can find rooibos in any tea shop around the world. 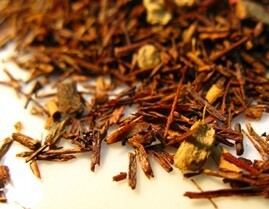 However, unlike other types of tea, rooibos does not have a long history as a commercialized tea. The indigenous people of the Cederberg region were called the Khoisans and they were Bushmen who had been harvesting the rooibos plant for many centuries. Dutch settlers in the Cape began to drink this beverage as an alternative to black tea, as it was expensive and hard to come by when they depended on the trade ships to and from Europe to supply them with tea. It was also a settler in the beginning of the 20th century, Benjamin Ginsberg, who decided to experiment with the processing techniques and ended up marketing rooibos tea on a global scale. He traded this wonderful herbal tea as “Mountain tea”, a substitute for black tea. However, it was during World War II that Rooibos played an important role as an alternative to regular tea, as shipping from Asian countries became nearly impossible. At that time, rooibos tea was still quite expensive and rare as rooibos seeds are rare and very expensive and production was limited. Some years later, in 1968, Annique Theron wrote and published a book that raved about the benefits of rooibos herbal tea, particularly when it comes to dealing with colic in infants. This sparked a wave of scientific studies around the content of antioxidants in the tea. Presently South Africa seems to be the only place where rooibos finds the optimal conditions of soil and climate to grow. Thousands of tons of rooibos are produced each year, half of which are consumed domestically while the rest is exported to a variety of countries around the world. The many rooibos tea health benefits originate from the vast quantity of the vitamins and minerals it contains. It is this richness that will keep you fit and healthy. It contains a high amount of vitamin C making it a wonderfully healthy beverage. In a single cup of this herbal tea you will find calcium, copper, fluoride, iron, magnesium, manganese, potassium and zinc. It contains a high level of antioxidants, of which aspalathin is a good example. This substance is almost only found in rooibos herbal tea and may be responsible for the many great benefits it can give you. The best known rooibos tea health benefit is its power to help digestion both in adults and in infants. So if you have a difficult digestion, this is the tea for you as it relieves indigestion and heartburn. A cup of this tea will help calm your stomach lining and relieve stomach pain. Rooibos may help you with painful stomach ulcers and the horrible effects of acid reflux. It may help with tension that is the cause of stomach and bowel irritation. Irritation in the digestive lining may lead to nausea, vomiting or constipation. So take a cup of rooibos infused tea to calm your whole digestive system down. In South Africa, this tea is traditionally used to dealing with infantile colic, so next time your baby is restless with cramps and colic, try giving the child a bit of this tea to help relieve the pain and help go back to a nice calming sleep. Rooibos tea can be a weight loss tea because it is nutritious and healthy. It helps to control your appetite and due to its natural sweet flavor it reduces sugar cravings that make every diet a difficult task. Exercising is essential and a great way to lose weight, but it may lead to loss of liquids through sweating. So to keep hydrated and replenish fluids and minerals in the body, you can opt to drink this herbal tea while you work out. A tea rich in antioxidants is perfect to fight disease and keep you healthy. Rooibos has a variety of polyphenol antioxidants that help boost your immune system, which means it helps you to heal better and reduce the chance of getting sick in the future. Drink rooibos tea on a regular basis to make the most of its anti-fungal and antiviral properties. Pollution and stress can take a toll on your body so building your defenses against free radicals that cause illness and age your cells faster is quite sensible. When you drink rooibos to boost your immune system, you also help it to react better to allergies and rashes. It works as an antihistaminic on your body preventing allergic reactions such as nasal congestion, stomach problems or anxiety. A tea made with rooibos may help you breathe better when you suffer from asthma or simply hay fever. It works as a bronchodilator, letting you get more oxygen when you need it the most. Rooibos is a naturally soothing and relaxing tea. This means it helps to maintain a healthy balance in the central nervous system, reducing irritability and anxiety. This is also why you will be able to get proper sleep and have fewer headaches. Unlike green or black tea, rooibos tea is caffeine free. It can be drunk before going to bed, it will actually aid in calming your body and mind when you suffer from insomnia or have trouble getting a whole night’s sleep. A cup of rooibos infusion everyday can help you to deal with nervous tension and even mild depression. It contains magnesium, which is great to keep your nervous system healthy and your brain functioning better. Rooibos infused tea is your liver’s ally. It stimulates the liver to function properly, helping to treat chronic liver disease and protecting it from damage that can come from, for example, overindulging in alcoholic beverages. Tea made with rooibos may indeed help with your hangover, but it does much more than that. This herbal tea helps you to achieve balanced hormonal levels, which is only possible with a healthy liver. This and its calming, caffeine-free nature help you deal with anxiety and depression. Another benefit of rooibos herbal tea is pancreatic health, which may help prevent oxidative stress and prevent the onset of type 2 diabetes. Applying rooibos tea topically may do you a world of good. It is said to clear the skin, ridding it of the bacteria that cause acne, bring relief to irritated skin as a result of sunburn, rashes or insect bites. It may even slow the aging process by keeping your skin healthy. Why not try it on your baby to clear a nappy rash? Other skin ailments may also be improved by using this tea to clear away infection. For example, use it as a gentle wash for skin diseases such as eczema, psoriasis or dermatitis. It may even help to prevent the occurrence of these ailments in the future. You may also apply this tea to your scalp when it feels itchy and dry. You can use it to rinse your hair when washing it. Being an herbal tea, free of caffeine, rooibos provides a healthy alternative to other teas and coffee as it lowers blood pressure. At the same time it also lowers bad cholesterol levels. A regular cup of rooibos tea will keep your heart healthy, beating at a regular rate, and reduce the risk of stroke or heart attacks, helping you to lead a long and full life. The high levels of antioxidants in rooibos herbal tea make it a great source of protection for your cells. Antioxidants prevent mutation in cells that can lead to tumors and cancer. By taking this tea you may be actively preventing cancer from destroying your organism. Which is best: green or red rooibos? When it comes to antioxidant action against the free radicals that damage DNA, studies seem to show that green (unfermented) rooibos is better than red (fermented) rooibos. Rooibos exhibits an ability to slow the damaging effects of time on the body. From keeping your skin cleansed and young, to promoting a healthy heart, this tea may also protect your brain cells from the toxins that can cause premature aging. Its high content of calcium, magnesium and fluoride is beneficial to building strong bones and teeth and may also slow the effects of decalcification that can lead to osteoporosis. Drink a cup of rooibos infused tea regularly if you wish to improve kidney health. This tea and its antioxidants work to reduce inflammation in the urinary system and can also help with prostatitis. The main difference between Rooibos and other types of tea such as black or green tea is its caffeine content. Rooibos tea is caffeine-free, which means you can drink more even when you are sensitive to caffeine and it means you can drink it at any time of day you wish. Another great thing about this tea is that it contains a lower level of tannins than the other teas. Less tannins means a less astringent and milder taste, that does not go bitter when brewed longer, and the same time it means that your body can absorb more iron and protein from ingested foods. If you are searching for the tea with the highest antioxidant content then choose green tea, then comes unfermented (green) rooibos, fermented (red) rooibos and finally black tea with the lowest antioxidant content. Would you like to try this red tea now? Though there are many rooibos tea health benefits, scientific studies have not been conducted so let’s take a quick look at some possible side effects of rooibos tea. Though quite rare, some people may be allergic to rooibos. These are the signs to look for: difficulty breathing, chest pain and tightness, difficulty swallowing or skin rashes. Stop drinking this tea and consult a doctor as soon as possible if symptoms persist. Iron absorption: how does rooibos compare to black or green tea? Well, rooibos may reduce your ability to absorb iron from food like other teas, but it is much less effective or damaging than black tea, so there is less risk of taking it with your meals. Lack of proper testing means there is little information about the risks of drinking rooibos infused tea while pregnant. The recommendation is that you check with your doctor whether you can drink this tea, according to your own medical history. At the time, there is no record of problems caused by rooibos tea, so if cleared by your doctor, you may take this tea to help with indigestion, heartburn or other issues that you would normally take a tablet for, but can’t while pregnant. This is a great tasting tea and as easy to brew as you would other regular teas. So let’s learn how to make Rooibos tea and enjoy cup after cup of this wonderful drink. Bring water to a boil. It is always best to boil more water than you need to so that you may use it to preheat the teapot preventing the tea from cooling down too rapidly. Once your teapot feels warm throw away the heating water and refill your teapot. 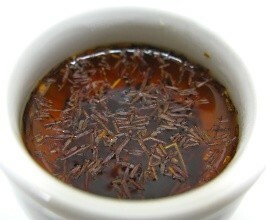 Place 1 teaspoon of rooibos per cup of water into the teapot. Let your tea steep for 5-10 minutes and it is done! If you wish to brew for a longer period of time, you will get a stronger tea. 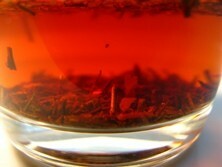 Unlike black or green tea, rooibos will not become bitter as it contains a very low amount of tannins. All that is left for you to do is to serve and sweeten according to taste. On its own, plain and unsweetened, this tea is considered to have a nutty undertone and a natural sweetness to it. You can drink it just as it and feel quite pleased. However, if you wish to drink this tea the South African way, then add milk and a bit of sugar or honey to sweeten your cup of tea add a dash of zest with a slice of lemon. The recommended amount of rooibos herbal tea is 6 cups a day at the most. You may also drink at any time you wish as it contains no caffeine, this tea will not keep you up at night. The great thing about this tea is that it can replace black tea in great blends like chai tea because its strong flavor stands well the addition of spices and milk. Give it a try. The green rooibos variety can stand to be steeped for a longer time and at much higher temperature than regular green tea. So it becomes a great option when no timer or thermometer is around to make accurate measurements. 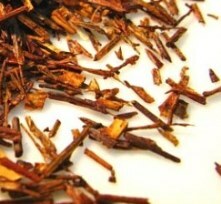 Like other teas, rooibos leaves may be brewed a second time. Make sure to store your tea in an airtight container that does not let any light in, to keep your herbal tea as fresh as possible. 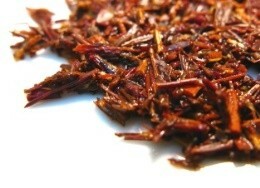 Rooibos can also become a refreshing cool drink when served as iced tea. You can even blend it with fruit juice adding its distinct color and flavor to any summer beverage. Buy Your Rooibos Tea Today! Click on the image or on the link below to purchase from Starwest Botanicals your Organic Rooibos. 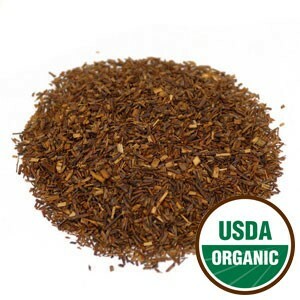 Make your tea with organic rooibos and experience the wonderful flavor of this herb. Relaxing and soothing, rooibos makes a sweet and nutty-flavored tea. Buy your Rooibos tea now! Click on the image or on the link below to look at the Rooibos selection at Palais des Thés (US). This caffeine free herb can be blended with spices, berries, vanilla, mint or so much more to create original and flavorful teas. There are many wonderful blends for your to taste that you are sure to find a healthy tea that is right for you. Choose your Rooibos blend now! Rooibos is the right tea for you!